One of the most awaited featured for the iPhone was the percentage battery. Like most requests Apple gets similar to this, these features are added with the next update. Luckily for us they did add the percentage battery in the 3.1.2 update! Now everything is all perfect right? Wrong, Apple decided to add this feature however only iPhone 3GS users got the percentage battery leaving the iPhone 2G and 3G users in the back…again. No worries though! Like usual I’m here to help us all, just follow the following steps and you can get the percentage battery on your iPhone. Like most iPhone mods, you need to have your iPhone jailbroken for this to work. Click me to learn how to jailbreak your iPhone. Exit Cydia and swipe the top like shown in the picture below. 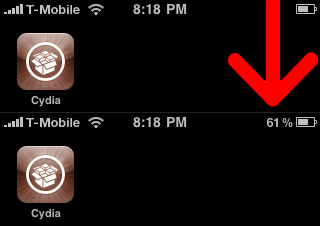 Now your percentage battery should show up! It’s a common substitute, since people get confused between iPhones when you refer to the original as “iPhone” rather than “iPhone 2G” as in iPhone edge… Just an easier way to distinguish the specific phone from the newer ones. I’m glad you liked the post though! What iPhone are you running?